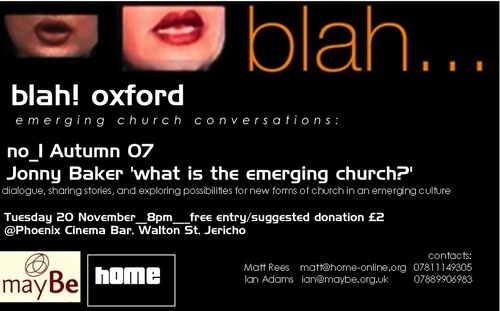 back in the early days of conversation about emerging church, we hosted a series of events called blah... these were conversational in various cities around england. the very first one was a discussion of pete ward's liquid church i remember. and we had tours with ryan bolger and karen ward and al hirsch amongst other things. seems a while back now! well if you are in oxford and free in the day time (yes sorry about that) a new series of pioneer witness sessions is starting. the format is simple - someone involved in something pioneering in mission gives a spiel for around 45minutes and then there is 45 minutes discussion, q and a, then a bit of prayer/worship. after the first one people are heading off for a chinese meal. it will be a good chance to meet people. johnny sertin is first up next week on october 18. there are 12 planned throughout the year. details here... and before anyone asks, yes they will be recorded and we'll put the spiel part up on the web site. Is institutional Christianity an outmoded organisational technology – slow, heavy-weight and rigid – and are there new, more light-weight and adaptable ‘skins’ that provide a more flexible and adaptable service… or is the move towards a more fluid, ‘TAZ’ Christianity no more than a flash(mob) in the pan, lacking substance or ground for genuine action? this thursday in oxford pete ward and i will be doing a double act exploring mission in consumer culture. it's at cms in oxford from 10am - 1pm, and only £5. more info and book here or you can pay on the door. How should Mission relate to a consumer culture? Some like to argue that the Christian faith as an 'alternative way' in an alien market driven world. So the Church is a community of those who resist the prevailing consumerist trend. But is this the only possible approach? Is it possible that Mission in the West requires us to seek to express or contextualise faith in consumer culture? This half day will explore the possibilities and limitations of Mission as contextualisation in a consumer culture. mission in consumer culture is a half day at cms on thurs 11 june in oxford exploring mission in a consumer culture with pete ward and then myself and cathy ross responding. you can book online. if you remember the day we had with brian walsh and sylvia keesmaat, it's furthering the discussion around the relationship between faith and culture. pete's latest book is excellent on this relationship - i reviewed it here. blah... has been pretty quiet in lots of places (i suspect we're all spinning too many plates) but if you are in manchester there is a day coming up on february 12 with pete ward - participation and mediation. i reviewed pete's book here - i think it's a really interesting book and this should be a great day. we're planning to have a day with pete at some time in the summer in oxford so watch this space if you are down south! there is lots going on as ever. i already mentioned ReSource below if you are looking for mission leadership training. but there are plenty of other things to consider or put in your diary. Dr Padilla has made an immeasurable contribution to the recovery of the Christian conscience. He has spent his life practising what he preaches: prison ministries, preaching on radio and on the streets, planting churches among slum dwellers and drug addicts, and now playing a key role in the Micah Network. sounds good eh? the padillas are with cms for a few months so i am looking forward to meeting them and gleaning some wisdom. follow the link for details on how to book. cms in oxford are really starting to get some interesting events at the mission education centre - another one is a day enough is enough (pdf), the title inspired by john taylor's book which was as ever ahead of its time. mike frost is also passing through oxford on october 9 - not organised by cms this time so we can't take credit but i'll be going along. it's part of a tour where he'll also be in london, portsmouth, southampton and bristol (sorry if you are anywhere north of oxford!). then of course we are back for a new season of grace - our year runs from sept to july with greenbelt in the middle. september is a chance to reflect on and commit together to god and the journey of faith, re-unite around our ethos and celebrate god's presence in the midst of our broken community we love. inspired by 1giantleap with a title lifted from their current dvd it's called wounded in all the right places. come and join us if you are anywhere near by. 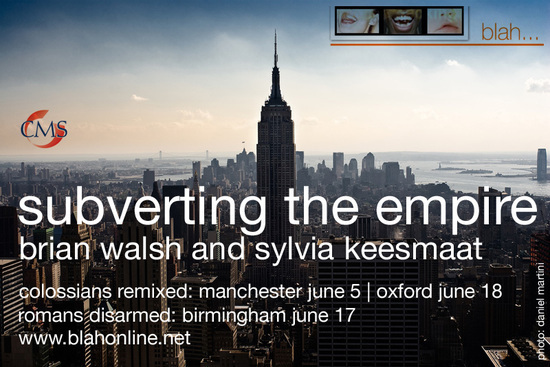 brian walsh and sylvia keesmaat are over in the uk doing some stuff for bristol diocese. we have managed to scoop them up to do three blah... days. i absolutely love their book colossians remixed (i review it here) and have been a fan of brian’s writing over the years. his book transforming vision changed my life! i expect these days to be really good. please spread the word. we are not doing printed publicity – just e-mail, blogs etc. the oxford and manchester days are on colossians remixed and the birmingham day is on romans with some new material. i know already of two other things it clashes with so sorry if that affects you. Who are you? What are you doing and why? The aim of Groundworks is to give a forum to encourage people in their journey, to inspire global collaboration, and connect them with something bigger than the stage that they are currently operating on, and to create space for friendship and mutual learning. This certainly fits with the aims of NET and we are ecxcited to host this day and have them with us. NET is a network of entrepreneurs engaged in social enterprise. Using business as a platform for change. NET meetings are now held on the fourth Monday of each month. blah sheffield have a couple of things lined up but are now using facebook to talk about them so i can't see what they are! As money for fully paid staff is an increasing luxury, and as the church is seemingly in increasing decline, how can we faithfully re-imagine church leadership and ministry today? And what would an authentic model of leadership look like today in a society where suspicion of hierarchy and of institutions is increasing? What does it mean to be ordained leader and be lay leader? And are these terms even useful today? this week is hectic to say the least... madly busy spinning various plates. in the midst of it i was pleased i managed to get up for a first visit to blah...nottingham yesterday. they had ray simpson as a guest speaker. he is the guardian of the communtiy of st hilda and st aidan. this is a dispersed celtic community which i find fascinating i must admit and i think some of the new monastic communities have lots to learn from guys like this who are a bit further down the road. they are running a summer school at durham on new monasticism - i'll put more info on here when i find it. tom, the guy who is co-ordinating the blah... there is part of the team at the malt cross, a pub in the city centre which is run by christians. it is a wonderful space - i remember years back when it was run as the potters house. they even have leffe on tap - i am easily pleased i know! this thursday 10 may sees the first evening blah... in london for a while. we've moved venues to the horsebar. come along for a drink and some conversation. ian mobsby will be sharing some nuggets and we are celebrating his book launch. it's free but please book in so we have an idea of numbers. see you there if you are going. i am heading up to nottingham next week on may 17 to visit blah... there which has just got going. ray simpson is speaking on celtic christianity. he sounds really interesting and is the guardian of the community of st hilda and st aiden. so if you are in that part of the world come along. blah... birmingham is also planning its first evening for a while on may 23 and have got an amazing evening lined up with aradhna and pall singh. aradhna played at greenbelt the year before last and are incredible. the evening is titled journeys to christ within asian spirituality. if you are anywhere in the midlands get yourself along there. we have the first evening blah... in london for a while coming up on may 10 with a change of venue - upstairs in the horse pub, waterloo. ian mobsby will be exploring the significance of emerging & fresh expressions of church from the insights of practitioners. drawing on research findings, ian will explore the trinitarian theology that seems to underpin the projects involved, and explore their dreams & hopes regarding engaging with new/old forms of mysticism of many who are spiritually searching in post industrial western nations. this is also a book launch/party to celebrate with ian and you can pick up his book at a reduced price. it would be great to have a good crowd. admission is free. we are no longer providing drinks but there is a bar. we are changing the way we track bookings so rather than e-mailing to say you are coming please register for the event here. it really helps to have an idea of who is coming. Over the last year, a number of new and exciting emerging churches or fresh expressions of church drawing on the specifically catholic and/or contemplative traditions have developed and joined other emerging churches coming from or out of a more evangelical perspective. These voices are few - but are nevertheless important voices. This day will then give room to explore how Emerging & Fresh Expressions of Church drawing on the catholic and Contemplative traditions bring particular resources to engage with those who are spiritually searching and what it means to be church. in some circles there is a criticism or suspicion that fresh expressions of church are just an evangelical thing so it's great this day is happening. don't feel that you have to be catholic/contemplative to attend though. it would be great to network across the traditions. a few people have been asking me what's happening so now you now. there is also stuff going on elsewhere in the country - check the blah... web pages to see. delighted that nottingham have started a blah... now. their evening with ray simpson on celtic christianity and the move of god today looks really good. anyway i wanted to give anyone anywhere vaguely near london a BIG REMINDER not to miss out. you can book online here. it helps us if you book in advance so we know numbers for lunch etc. hope to see you then. Popular culture in the West is ready for the entrepreneur. Its uncertainty and rapid change is the entrepreneur’s natural habitat. The greater publicity being given to entrepreneurs shows that society is starting to grasp this new imperative and run with it. on my way to sheffield for the first blah... there - contrary to what it says on the web site i am not going dutifully - i am delighted to be invited and looking forward to it! 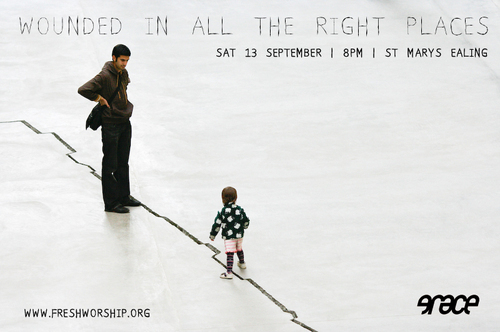 we'll be looking at images and reflecting on the contours of a christian spirituality that connects with everyday life. hopefully very relaxed and conversational. just realised i haven't blogged about this before now - oops. but if it's not too late and you're around come along. sounds like a cool venue as well. it's all been a bit quiet on the blah... front but we are gearing up for action. it wasn't exactly planned this way but we have almost got a sort of tour happening with bill bolton on the entrepreneur imperative. i blogged about bill's grove booklet on the entrepreneur and the church a while back. since then i have been getting to know bill a bit and he has offered to do some blahs around the place on this entrepreneurial stuff. the london one is going to be a day on the ship HMS President on the thames embankment which is pretty cool for a venue! it's on saturday march 31 10am - 4pm. you can see the details and book online. other dates are planned for manchester, nottingham, and birmingham - see the tour page of www.blahonline.net with possibles for orkney and liverpool being lined up at some future point. nottingham and sheffield are getting started with oxford and newcastle contemplating doing so at some point soonish. because of interest from other places in getting started we have developed a new web site that is wiki based - the idea is that each local blah can add and edit its own pages without having to wait for me, gareth or anyone else to do it for them. if you are using safari on a mac it doesn't seem to like the pointed link so try blahonline.wetpaint.com which should work for you.